This story can’t go on forever. Television is a medium theoretically designed to allow for stories without end, but almost all of the best shows have self-limiting premises. At the core of nearly every great show is some fundamental goal that drives the actions of the protagonist, with perhaps some more minor but nonetheless compelling objectives that define the secondary characters. 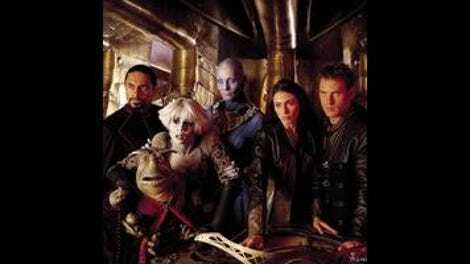 Farscape has danced around several such motivations for much of its run. John Crichton wants to return to Earth, John Crichton wants to stop Scorpius, and John Crichton wants to be with Aeryn Sun. (More on that in a moment.) D’Argo wants to reunite with his son Jothee, and D’Argo wants vengeance on Macton, the Peacekeeper that framed him for his wife’s murder. Rygel wants to reclaim the Hynerian throne. Chiana wants to find her brother Nerri and join the Nebari resistance. Aeryn Sun rarely wants anything quite as concrete as the others’ desires, but she generally strives to find a place in the universe, somewhere that she can become the best possible version of herself and that she can be happy. Look at that list and consider just how many of those goals have been realized over the first three seasons. D’Argo did find Jothee, but that was an abject disaster, one that deeply damaged two of his most important relationships. Aeryn did find her place this season, but it was on Talyn with Crichton, and both of those individuals are now dead, leaving her as lost and closed off as she has ever been. And those are the successes! The shipmates’ remaining goals are so amorphous and faraway that it’s easy to forget that they even exist; Rygel is really the only one who talks any significant amount about his long-term goals, and even he doesn’t have the first semblance of a plan to achieve his aims. The deal with Scorpius has now given him and the others the vital pieces of information they need to move onto the next stage of their lives, and “Dog With Two Bones” reflects on that transition by consider what this supposedly completed stage has comprised. In the coldest possible reading, the last three seasons have never been anything more than simple survival. These were always just a bunch of fugitives thrown together against their will and forced to work together because any other course of action would leave them in Peacekeeper captivity. How Rygel summed things up in “Self-Inflicted Wounds,” basically. The truth is far better than that. For all their initial misgivings, the Moya shipmates have become friends, even family. Yes, the mounting hopelessness of their situation forced them to place their individual agendas on the backburner, but all of the friendships and romances that we’ve witnessed over the last three seasons weren’t simply the result of their impossible circumstances. Think of it this way: Being stuck together on Moya probably was the only scenario in which D’Argo and John would become friends, but that doesn’t make their friendship any less meaningful, even beautiful. The trouble is that, even if the bonds forged onboard Moya are strong enough to endure even after separation, that doesn’t really mean anything, at least not on an everyday sort of basis. I mean, it’s a pretty sentiment, and it might even be true—just listen to all the fond goodbyes the others give Crichton in the episode’s closing montage—but it must feel pretty damn hollow when all that one is left with is quite literally the void of space; that’s true even before Moya unexpectedly gets sucked into a wormhole, leaving Crichton more stranded than he has even been before. 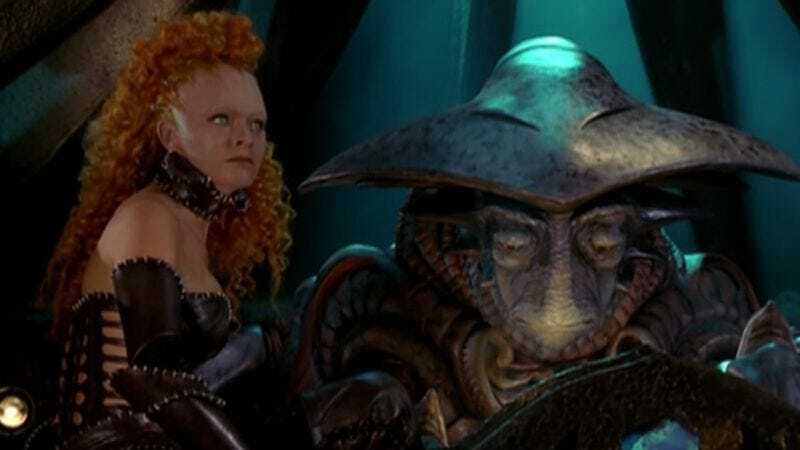 The nature of living in deep space in the Farscape universe is that other people effectively cease to exist the moment they are out of a ship’s relatively small communications range. Under those circumstances, it may well be utterly selfish for Crichton to want everyone to stay, but it’s equally selfless to let them depart. Not that Crichton really has much of a choice, what with the climactic coin flip and the fact that he spends a good chunk of this episode fantasizing about impossible futures, possibly because he’s frequently drugged out of his gourd. This is a whole new kind of trippy Farscape episode, in that “Dog With Two Bones” doesn’t even pretend to explain what the frell is going on. I mean, the basics are straightforward enough: Crichton is seeing both the best and worst possible versions of returning to Earth with his friends, and the mysterious old woman is using her incredible herbs to guide him toward truth. But we learn so little of the woman’s motivations—indeed, it’s only midway through the episode that the shipmates realize she’s a stowaway and not someone else’s guest—and the narrative flits so freely between what is real and what is fantasy that it can be difficult to untangle precisely what’s going on. Without precise execution, such storytelling can end up somewhere between baffling and infuriating, but David Kemper’s script strikes just the right balance, give or take the intentionally out-of-nowhere revelation that Aeryn Sun is pregnant. But everything else follows a coherent if dreamlike logic, as the audience watches Crichton try to reconcile the two incompatible parts of his life before finally recognizing that the two can never be made to fit together. In this episode, the hazy narrative simply allows the show to burn away the inessential and get right at the heart of Crichton’s emotional truth. In that regard, “Dog With Two Bones” feels like a true culmination of the story told throughout the third season. The episode’s eponymous metaphor posits that Crichton is forever torn between his love for Aeryn and his need to return to Earth, a task that would require mastery of wormholes. Broadly speaking, those two desires describe the paths of the Talyn Crichton and the Moya Crichton, respectively. The former got to run away with Aeryn deep into the Uncharted Territories, building their relationship to a place that it could never be in the first two seasons. The other Crichton struggled to find any meaning at all in the absence of Aeryn, but he did throw himself into the search for wormholes, compounding the mistakes he made in “Self-Inflicted Wounds” and driving an ever deeper wedge between him and his friends. As much as Crichton here suggests that Aeryn and Earth carry equal weight in his heart, there’s no question at all which of the two was the consolation prize. And, just to rub salt in the wound, it was the Talyn Crichton who was ultimately given the gift of complete wormhole knowledge. Yes, he died soon thereafter, but not before Aeryn happily, assuredly agreed to return with him to Earth. For those brief few minutes in “Infinite Possibilities,” the dreams of “Dog With Two Bones” sure didn’t look impossible. But then, it’s what happened next in “Infinite Possibilities” that now puts that happy fantasy out of Crichton’s reach. The death of his twin has placed a seemingly insuperable barrier between Aeryn and John, and Officer Sun is prepared to run off and join a crack Peacekeeper assassination squad instead of deal with her morass of feelings. It’s really only that emotional distance that makes Crichton yearn for Earth at all. Getting home hasn’t truly felt like a priority for John for some time now—I’d be willing to go as far back as “A Human Reaction”—and it’s probably not a coincidence that every time this season he has gotten serious about it has come after Aeryn pushed him away. Officer Sun told him they could not risk romance after her death and resurrection, and then “Self-Inflicted Wounds” happens. Aeryn goes off with one Crichton, and the aimless spare spends his time chasing wormholes. And now, in “Dog With Two Bones,” Crichton almost appears to use Earth as a way to repair his shattered relationship with Aeryn, as though escaping home might allow them to rediscover the true love that a uniquely incomprehensible tragedy has so severely tested. He’s ultimately prepared to throw away any dreams of Earth in favor of convincing Aeryn not to leave him, but it’s not really him who ever needed to find clarity. Crichton hesitates not because he’s unsure of what he wants but because he’s afraid of what Aeryn wants; it’s unlikely Aeryn would have come to any more favorable a decision if Crichton had confronted her at the beginning of the episode than at the end. Still, to run with the episode’s chosen metaphor a little while longer, I would suggest John Crichton actually has three bones. Yes, Crichton wants to be with Aeryn and he wants to return to Earth, but he also—and this is the really irreconcilable bit—wants to stay with his friends. On a metatextual level, he wants Farscape to continue, and the only way for this show to exist is for Crichton and a band of alien fugitives to spend their days roaming the Uncharted Territories on the run from all manner of evil. At a push, one could see how Aeryn, who looks completely human and has no other natural home, could be assimilated into life on Earth. But D’Argo? Chiana and Jool? Rygel and Pilot? As much as I could indeed imagine Australian youths thinking D’Argo is the coolest person ever, there’s just no way that they could build any sensible life for themselves on Earth, and Crichton’s fantasies move into ever more ridiculous territory as he strains to incorporate them. At the same time, especially with Talyn now dead, it’s not possible for the adventure to continue while each shipmate pursues an individual agenda. No, the only way for Farscape to continue is for everyone to remain together on Moya, for things to be as they always were. Except, as this show has taught us again and again, things are never as they always were. “Premiere” established one baseline for what passes for normal on Moya, but it’s been a moving target ever since. Friendships have been formed, broken, and regained. Loved ones have been lost along the way, though their lessons can endure; in one of this episode’s most moving scenes, a nervous Chiana tries to live by Zhaan’s example by telling Moya to do whatever she feels is right to honor her son. Enemies can become allies, even if the shipmates here still can’t quite believe that Bialar Crais sacrificed himself in “Into The Lion’s Den.” And a ragtag group of overwhelmed fugitives can become some of the galaxy’s most fearsome adversaries. People who spent a good portion of their first proper adventure together hiding in a frelling tree have since blown up, in order, a Gammak base, a shadow depository, and a command carrier. These are dangerous people, and the scariest thing is that they don’t fully understand how dangerous they actually are. “Dog With Two Bones” underlines that point with the rogue Leviathan subplot. The deranged, grief-stricken ship is initially presented as a serious threat, one so capable of crippling Moya that even Aeryn considers the possibility of a tactical retreat. But when D’Argo and John unleash the full power of the Luxan ship, the Leviathan crumples into nothing, and all the shipmates can do is look on in horror at what they have unleashed. Only Rygel is jubilant, as he realizes that they are all at last free to follow their own destinies. Perhaps he’s right. Perhaps the Moya crew should split up anyway, for their own good and for the good of the galaxy at large. Part of telling a story over multiple seasons of television is dealing with escalation, the notion that the stakes can only ever get bigger and more serious as time goes on. That’s true enough: “Nerve”/“The Hidden Memory” was more epic than any previous Farscape story, but it was dwarfed by “Liars, Guns And Money,” which in turn was made to look small by “Into The Lion’s Den.” This season has occasionally suggested that the Moya crew have become the stuff of legend; most notably, “Scratch ‘N’ Sniff” pointed out how utterly Crichton and D’Argo failed to live up to their reputation. But “Dog With Two Bones” explores the even more worrying flip side of that, as here everyone involved does live up to their reputation. Jool asks D’Argo whether he can live with taking a life, and he just shrugs off the question. Yes, maybe it is time to move on. Well, at least she sort of called him “John.” That’s a start. But we really are going to have to deal with that whole pregnancy business. Till next time, fly safe, everyone. Kent McCord makes another return appearance as Jack Crichton, and he’s probably my favorite recurring character on the show. I just love that Jack can somehow both be Chiana’s semi-sleazy love interest and the man who delivers a most moving, if tragically interrupted, toast at John and Aeryn’s wedding. For the record, I don’t think that sales clerk was really trying as hard as she could to understand Aeryn. I thought that was a quite reasonable approximation of “Charge it,” especially given the fairly limited range of things Aeryn could say in that particular context. I like that Jool finally feels like a true member of the crew here, especially when she attempts to convince Aeryn not to go backward. Sure, the exchange ends with her in agonizing pain, but that’s just how Aeryn communicates these days. Next time: We’re going on break again, but, as I said in the main body of the review, we’ll eventually be back. In the meantime, it’s been a pleasure and a privilege to talk through the third season with you all. Looking at the whole thing in totality, I’m not sure if I’d say this year is my absolute favorite—I have a soft spot for season two, and a slightly more irrational soft spot for season one—but, yeah, this one is probably the best. Not that I’m reigniting a massive, years-long debate or anything. Either way, that still leaves season four to reconsider, and I’m looking forward to it.